This is the seventh installment in the series, Green Turtle Cay 101: A Guide to Getting Here, Staying Here, Dining Here and Playing Here. Beyond boating and fishing, sunbathing and sandcastle building, visitors to Green Turtle Cay enjoy access to a variety of land and water sports. Tom snorkels with young sharks during a day trip with Lincoln Jones. Green Turtle Cay offers terrific snorkeling right off shore. Bita Bay is our favourite snorkeling spot, because there’s a small reef just a few yards from shore. Most of the time, the bay is relatively calm, making it a great snorkeling destination even for beginners or kids. There’s also amazing snorkeling along the reef that runs along GTC’s northeast coast, though it’s a longer swim out and as such, might be best left for experienced swimmers and/or very calm days. If you’ve got access to a boat, there are a number of popular snorkeling sites at or around nearby cays. And for an organized, guided experience, both Brendal’s Dive Center and Lincoln Jones offer snorkeling trips. Brendal’s Dive Center, located beside the Green Turtle Club offers a variety of SCUBA, snorkel and adventure trips. Brendal’s Dive Center can be reached at (242) 365-4411 or hailed on VHF channel 16. The waters around Green Turtle Cay are shallow, clear and ideal for exploring — especially White and Black Sounds, and Bita and Coco Bays. You’ll spot starfish, sea urchins, conchs and, if you’re lucky, turtles or a sting ray feeding in grassy areas. Kayaks may be rented through Brendal’s Dive Center. Through their company, Abaco Paddleboards, Green Turtle Cay native Sarah Sams and her husband, Jesse Golon sell and rent paddleboards. They also offer lessons, tours and day trips, where you can see blue holes and get face-to-face with the local sea life. To rent a board or arrange a paddleboard experience, contact Abaco Paddleboards at (242) 475-0954. Board rentals and lessons can also be arranged through Pineapples Bar and Grill at (242) 365-4226 or by hailing them on VHF Channel 16. Green Turtle Cay boasts its fair share of gorgeous beaches. Sometimes, though, you just want a quick, cool dip without sandy feet and with the convenience of food and drink close at hand. For those days, there are swimming pools available to guests and bar/restaurant patrons of Bluff House, the Green Turtle Club, Pineapples Bar & Grill and the Lizard Bar & Grill. 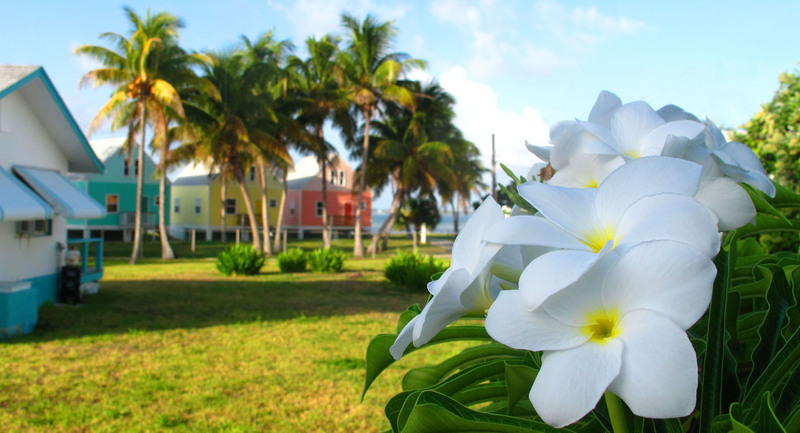 If you’re looking for a great way to explore the cay and to get a little exercise at the same time, bicycles are available for rent at Brendal’s Dive Center. Aside from the big hill northeast of town, and one leading to the Tranquil Turtle Beach Bar at Bluff House, most of the cay is relatively flat. The streets in town are paved, and the main road that runs most of the length of the cay is smooth in most places. Just north of the settlement, there’s a tennis and pickleball court at the Leeward Yacht Club. To rent the court and/or equipment, contact the club office at (242) 365-4191 or (242) 577-4111 or email info@leewardyachtclub.com. If you’re up for shooting hoops, drop by the basketball court in the center of the settlement. There’s usually a basketball there and a few local kids willing to take you on. Though there’s no golf course on Green Turtle Cay, there is a full 18-hole golf course just a ferry trip and 5-minute taxi ride away, in Treasure Cay. Further south, beyond Marsh Harbour (about an hour’s drive from the Green Turtle Cay Ferry dock) is another golf course at the Abaco Club.